Mohammad Qayum Ebrahimi son of Abdul Razaq Ebrahimi is from Parwan province – Surkh Parsa district of Turkman Valley. He has completed his primary school in Kabul and got his Baccalaureate from Peshawar. He got his BA in the fields of Economics, Political Science and Public Administration from Nizam College of Osmania University; later on Ibrahimi got his Post Graduate Diploma (Masters) in Business Administration from England. Ebrahimi is now the member of the Oversight Commission on Access to Information and being the General Director to the AYVO, Director to NTSA, member of the CSHRN and Chief Editor to the Dar-e-Turkman Youth Council Magazine. Ebrahimi was the English News-Caster to Jawan Global TV Network, Program Manager to Hambastagi Foundation, where he was a teacher to the English Language and Computer Programs for over five years. 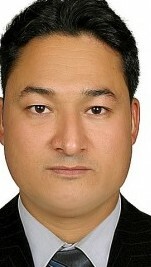 Ebrahimi as a vice-president to the UOMC has guided and helped the Afghan students to India and England for pursuing higher educations; after all, Ebrahimi has worked in different companies with the American Engineers for the reconstruction of Afghanistan where he was appreciated by.